Comfortably carry a camera or pair of binoculars weighing up to 7 lb with the made in the USA, black Fashion Strap from OP/TECH USA. The neck strap is adjustable from 35-40". For strength and durability, the 1.5" pad is constructed from bonded neoprene connected to nylon webbing and 3/8" quick disconnects. Two flat cord 3/8" connectors attach to carrying lugs on your gear. Box Dimensions (LxWxH) 26.0 x 3.55 x 0.75"
Fashion Strap (Navy Blue) is rated 4.6 out of 5 by 15. Rated 1 out of 5 by Anonymous from Grown to hate this strap I love neoprene straps for their shock absorbsion. I have an old German strap that I wish I could buy, but the label fell off and I can't find them anymore. The reason I mention this is the German strap is everything the Op/Tech should be, but isn't. Two big issues: The plastic ends on the Fashion strap are stiff, and get in the way. I'd suggest you consider Op/Tech's Uni-Loop System Connectors to make that problem go away. The second issue is that the neoprene strap has nylon cloth on both sides, and that allows the strap to slip off my shoulder. I almost dropped my camera several times, catching it before it hit the ground. The German strap is nylon cloth on one side and skin (bare neoprene) on the other. It never slips, even when I run. I tore the nylon cloth off one side of the Fashion strap and that works. But it looks bad now. 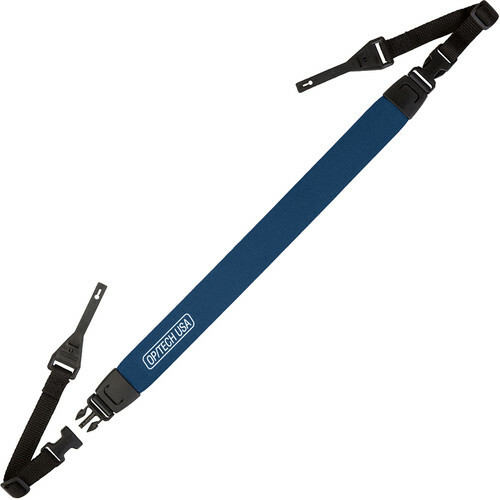 If Op/Tech gave us this strap with the Uni-Loop System Connectors and uses a nylon/skin neoprene, it would be perfect. But they don't, so I'd suggest avoiding this strap. Rated 4 out of 5 by JCY from Excellent choice at an excellent price. This is an excellent strap. It's squishy foam so it feels good on your neck all day long. The snaps seem secure and overall, I highly recommend it. My only complaint would be that I wish it was about 4-6 inches longer so I could sling it under my arm more comfortably when not needed. Overall, excellent choice. Rated 4 out of 5 by Anonymous from may not fit smaller cameras Although this looked like an excellent strap, I had to return it. The attachment fittings on the strap were too wide to use it on the point and shoot I'd ordered it for (a Panasonic Lumix ZS60). Rated 5 out of 5 by J. Gaspar Rivera from The Best Camera Straps! Op/Tech USA makes the very best camera straps that you can buy. Once you try one, you don't go back to anything else. Why? These neoprene straps are very, very comfortable! And when you use one of these straps, you feel as if you are carrying a less weight. At this moment, I have three Fashion Straps. One is about 10 years old, and it still looks new. That equals great value. To sum up, I highly recommend these wonderful camera straps. Expertise: Part time professional photography. Rated 5 out of 5 by Stormin44 from OP/TECH FASHION STRAP I have these straps on 4 of my 5 cameras( the 5th is a pocket style camera ). These straps are so comfortable I would never be without them. Two of them are approx. 12 years old & still in excellent condition. CONGRATULATIONS Op/Tech for making my photographic hobby an even greater pleasure. Problems Encountered: Absolutely no problems. Previous Equivalent Items Owned: Original camera straps. Rated 5 out of 5 by Rodeo Bob from Not for Nikon P520 I have several OP/TECH straps and use them on a variety of cameras. They are very comfortable and I much prefer them over thinner straps without any cushion. I can wear these straps all day and not get a sore neck. Beware, however, the most recent fashion strap I purchased does not fit the Nikon P520 camera and I have yet to figure how to adapt it so that it will. Rated 5 out of 5 by Calvin W from These have been around for a long time I've used this style of Op/Tech strap for over 25 years going back to film 35mm SLRs. They are comfortable, spread the load, suprisingly don't get excessively dirty over time, attach easily and are secure. I would only wish they had something a bit smaller, strap and attachment hardware as the Fujifilm X-E2 does not require much but maybe next time. Rated 5 out of 5 by Laura from exactly what I wanted I use this strap to carry my Canon EOS 60D digital camera. It offers an extremely secure, comfortable way to carry the camera around the neck, or shoulder. Its locking connectors give me worry free support that can't be beat. I just wish they wouldn't call it a fashion strap; it sounds too frivolous for the important function it fulfills.